Fr. 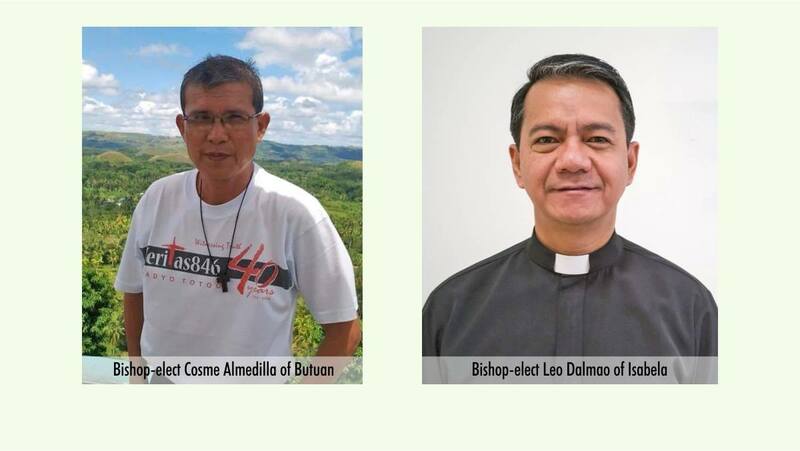 Cosme Almedilla will be the new bishop of Butuan and Claretian Fr. Leo Dalmao will be prelate of Isabela in Basilan. Pope Francis on March 25, 2019, named two new bishops for the Philippines. The announcement was made by the Vatican and reported by CBCP News. Fr. Almedilla, a clergy of the Diocese of Talibon, succeeds Bishop Juan de Dios Pueblos who died in October 2017. A native of San Miguel, Bohol, the bishop-elect is a product of the St. John XXII College Seminary in Malaybalay City and the Loyola School of Theology (LST) in the Ateneo De Manila University. He was ordained a priest on Aug. 4, 1987. Upon his appointment, the 60-year-old priest has been serving at the Holy Child Parish in Ubay, Bohol. Among his previous assignments include being the spiritual director at the John XXII College Seminary, Director of the Holy Child Academy in Bohol, and chaplain at the Asian Hospital and Medical Center in Muntinlupa City. Since 2015, Almedill, who is also known for promoting the Basic Ecclesial Community movement, has been Assistant Pastoral Director of the Talibon diocese. Fr. Dalmao, meanwhile, will take over the post from Martin Jumoad, who was appointed archbishop of Ozamiz in October 2016. The bishop-elect is currently serving as Consultor and the Prefect of Formation at the Istituto Guiridico Claretiano in Rome, Italy. At 49, he will be the first Filipino Claretian to become a bishop. Born in Tagbilaran City, also in Bohol, he entered the Congregation in 1986 and studied philosophy at Claret Formation Center, now known as St. Anthony Mary Claret College. After his theology studies at the LST, he was ordained priest by the late Bishop Emeritus José María Querejeta Mendizábal of Isabela in 1997. Mendizábal was a Spanish missionary who served as the first Claretian bishop in the Philippines. Bishop-elect Dalmao is not new to the prelature. After his ordination, he was assigned in Basilan where he served as project coordinator for indigenous people Samal-Badjau. “Fr. Dalmao’s years of stay in the place provided him a chance to know and experience the life and mission of the Claretians in the whole southern Philippines,” his Congregation said. In 2000, he was named Prefect of Students and three years later, became Novice Master while serving as Consultor and Prefect of Formation of the Philippine Province. Ten years later, he was elected as superior of the Philippine Province of the Claretian Missionaries. While serving the post, he was also elected as co-chairperson of the Association of Major Religious Superiors in the Philippines until he was transferred to Rome in 2015. Fr. Dalmao remains to be the first and the only Filipino priest elected to the general government of the Claretians worldwide.